Our unity allows us to protect our schools and our rank-and-file members from some of the most aggressive schemes cooked up by CPS and City Hall. Nowhere is this unity more important than at the school level, where issues that may seem relevant to only one member can actually galvanize a school and set a precedent for members across the city. This is particularly true when grievances move to arbitration and we win—a form of effective struggle that mobilizes members to take action that forces CPS to obey our contract. The Union has recently won arbitration victories in five separate cases related to unsatisfactory REACH ratings, layoff rights, the timely filing of grievances and religious holidays. Arbitration cases are complex, time-consuming and costly to fight. CPS knows this, of course, and its tactic is often to force grievances into the lengthy arbitration process, which delays justice, depletes union resources and wears down opposition to its mistreatment of members. We don’t put up with that. These five arbitration wins represent our refusal to surrender our contract rights or let the abuse of any member stand. Maxine Boyland was the most senior teacher on staff at Brennemann Elementary in the 2013-2014 school year, and had taught there for 23 years when her principal issued her an Unsatisfactory rating. She was selected for layoff out of seniority order because of the rating. The principal, however, failed to provide her with evidence, observation scoring and reflections via RLS for all of her observations—as mandated by Article 39-2.3(C)(6) and 39-5 of the 2012-2015 contract—and instead, claimed to have given her hard copy printouts with feedback on them. The Board of Ed would only have been able to avoid arbitration in this case by agreeing to not only rescind Ms. Boyland’s rating, but also to reinstate her to Brennemann and issue her back pay for the three school years since her layoff. Not surprisingly, the Board was unwilling to do that voluntarily. The Board argued in arbitration that this was a de minimis violation which did not warrant overturning the rating. The Union argued that this was a violation of an unambiguous, mandatory contractual evaluation procedure that caused real harm to Ms. Boyland, and real harm to the integrity of the teacher evaluation system across the school district. The arbitrator agreed with us. Mr. Ciborowski is a 25-year CPS veteran who was teaching P.E., health and drivers’ education at Bronzeville Academy when he received a Developing rating for the 2015-16 school year that converted to an Unsatisfactory rating under the two-developing rule. Mr. Ciborowski was laid off out of seniority order in October 2016 due to the rating. His CTU field representative filed a grievance on Mr. Ciborowski’s behalf challenging the rating. The principal failed to conduct Mr. Ciborowski’s first formal observation during the time the instructional module discussed at the associated pre-observation conference was taught, as required by Article 39-2.3(C)(4). The principal conducted Mr. Ciborowski’s first informal observation during an ILT learning walk (which is prohibited by the REACH Handbook). Ciborowski’s first informal observation lasted less than the 15-minute minimum duration for an informal observation under Article 39-2.3(A)(2). The arbitrator sustained all three allegations and found that they were each independently sufficient to overturn the rating. Adopting the reasoning of other arbitrators in previous REACH cases, the arbitrator also ordered the Board to rescind Mr. Ciborowski’s rating and make him whole for losses he incurred as a result of the contract violations. The grievant is Sundy SaTsu, who taught Japanese language at Lane Tech. He had two issues. First, he challenged his Developing rating for the 2014-15 school year, but the Board contended that the grievance was filed one day too late on March 4, 2016. Second, he was laid off in the summer of 2015 when Lane Tech expanded the Japanese language program to a full-time teacher. The Board contends that part-time teachers have no seniority rights and allowed the principal to make a new hire for that full-time position. These issues are related, because, if we consider the new full-time position as involving a denial of recall rights, then SaTsu needs to have a rating better than Developing to be entitled to recall. The arbitrator followed four prior awards and rejected the Board’s position that part-time teachers have no seniority rights. The Board took the position that part-time teachers give up their seniority upon becoming part-time, and can be replaced by new hires at the Board’s whim (as happened here). 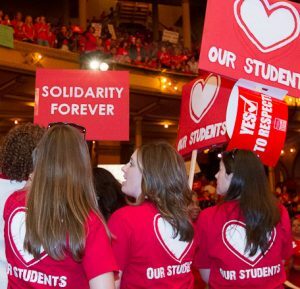 But the arbitrator ruled that the contract says part-time teachers retain their seniority rights and cannot simply be laid off in order to be replaced by a new hire. The arbitrator found that the 2014-15 Developing rating was invalid because the observations were spaced too closely. However, because he saw the second issue as a matter of layoff and not of recall, this ruling affects only what SaTsu’s rating of record will be upon reinstatement. This particular case involved culinary arts teacher Gloria Simpson from Chicago Vocational High School. There were two culinary arts teachers at CVHS. When one of those positions was eliminated in March 2016, Ms. Simpson was selected for layoff out of seniority due to her 2014-15 rating. Thus, the challenged rating effectively caused her layoff. She worked as a substitute during the 2016-17 school year and retired in June 2017. The arbitrator deemed the grievance timely. He first held that this was a 3-8 grievance, which is subject only to filing in a reasonable time, so the strict 45-school-day limit does not apply. This was following the ruling from another arbitrator earlier this year. But he went on to say that if that limit did apply, a School Improvement Day should not count as a school day, because dates when students are not in school do not count as school days, according to the sections of the CBA about substitute teachers and also according to Department of Education regulations. Once the arbitrator concluded the grievance was timely, the Union and Ms. Simpson won automatically because her observations were undisputedly spaced too close together. The arbitrator did not rule that Ms. Simpson’s retirement should be rescinded in remedy. Rather, he remanded the case to the parties to try to work out a remedy. A CTU field representative is working with Ms. Simpson and the Board toward an agreement. Lauren Gould is an elementary teacher who observes the Jewish holiday of Yom Kippur. Because Jewish holidays run from sundown-to-sundown, over the years she would take off the school day when Yom Kippur begins, because part of her observance of Yom Kippur is completing certain tasks before Yom Kippur begins at sundown. In 2016, the Board approved the school day before Yom Kippur, but in 2017, it did not. Exactly why the Board’s approach differed in 2016 and 2017 was a mystery to the Union until we got to the hearing. At the hearing, the Board explained that it changed its practice in regard to granting requests for religious holidays in mid-2015. Before the change, the Board granted all requests without question. After the change, the Board created a list of holidays that it would approve without question along with a list of dates for each year of when those approved holidays fall. If a teacher requests one of the dates on the list of approved religious holidays, the teacher would be granted the holiday. If the teacher requested another date, the request would be denied. The teacher could appeal the denial, but the Board only accepted appeals where the teacher proved that the “breadth of the tradition as it is practiced in the United States” required observers to refrain from working. Practically, this meant that teachers following less-well-known religions or denominations could sometimes have their holidays added, but otherwise appeals generally would not be successful. The arbitrator held that the Board could not change its treatment of Gould from 2016 to 2017 without telling her that it was changing its rules. Thus, he did not rule on whether the list of approved dates is proper or not, but only that the Board cannot secretly change its treatment of requests for religious holidays by creating a secret list of pre-approved dates. 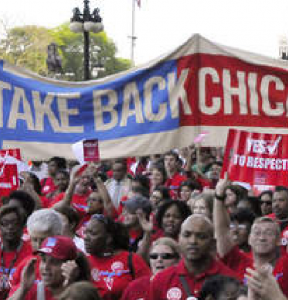 Illinois is now “right to work for less.” Beat the anti-union attack. Join CTU!